My tank landing craft was LCT (CB) 2337 with Sub Lieutenant R. W. Rawlings RNVR as Commanding Officer, myself (also a Sub Lieutenant) as 1st Lieutenant (second-in-command) and ten crew. Our LCT had been refitted as a CB (Concrete Buster) so that it could carry two tanks on a raised after-deck, able to fire their guns over the bows and the other vehicles being carried onboard, at enemy targets whilst approaching the beach. Our pre D-Day exercises were with the 13/18th Hussars (Queen Mary’s Own) part of the British 27th Armoured Brigade using Sherman tanks with 17-pounder, high-velocity guns, commanded by Lieutenant Knowles. We eventually loaded the Hussars on 3 June as part of the close range support for the assault on SWORD beach. Two Sherman tanks were on the raised after-deck with a ‘flail’ and AVRE (Armoured Vehicle Royal Engineers) tanks forward on the lower deck. Bad weather caused D-Day to be postponed so this meant a choppy and uncomfortable experience for our army colleagues whilst lying at a buoy outside Portsmouth. At 0900 on Monday, 5 June 1944, we sailed in company with the 100th LCT (A) flotilla; still in a choppy sea and poor visibility. Heading for the Nab Tower, we joined an incredible variety of craft all meeting at a point we already knew as ‘Piccadilly Circus’. Station keeping (keeping the right distance from other vessels) became more difficult during the night as we proceeded across the English Channel, and with a full load of tanks, ammunition and army stores, the tank deck and mess decks (accommodation) were awash due to the sea conditions. The final approach to the Queen sector of SWORD beach was without incident. The Sherman tanks did not open fire on any target on the shore and the touch-down on the beach was within five minutes of the planned H-Hour with all vehicles leaving our craft safely. However, immediately after the tanks had gone ashore, the enemy opened fire onto the open tank deck. We quickly closed the large bow door and started to turn 180 degrees to get back to sea, but as we turned we were hit by shell and mortar fire. The crew of the starboard Oerlikon gun were knocked out, and the Commanding Officer received splinter wounds to his arm and hand. Once we were clear of the beach area, we made for a hospital ship and managed to transfer the mortally wounded crew of the Oerlikon gun, but Sub Lieutenant Rawlings remained on board in command. We had problems in navigating, as the compasses were out of action. Also we had taken in tow LCT 2334 which had severe damage to the bows and was without steerage or power. This situation meant that during the night of D-Day progress was extremely slow, with our mess deck and galley damaged and persistent problems with power in our engine room; however, we did have a good supply of warm sustenance from the army’s surplus stores of self-heating soup and cocoa. Early in the morning of 7 June a helpful RAF Air-Sea Rescue launch guided us onto a course to steer, enabling us to join the shipping queue back to ‘Piccadilly Circus’, the Nab, eventually Spithead and Portsmouth, where we arrived in the early hours of Thursday, 8 June. Sub Lieutenant Rawlings, our wounded Commanding Officer, was put ashore in Portsmouth for hospital treatment. Our craft, LCT 2337, now under my command and still towing LCT 2334, made its slow progress up the Solent to Thorneycroft’s yard in Southampton for repairs. So ended my D-Day: successful, but with a loss that all the crew felt, each in his own way. 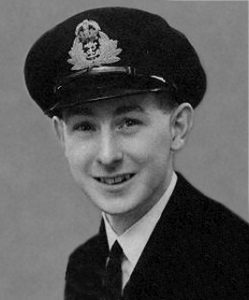 The sequel to D-Day was that Sub Lieutenant Rawlings was awarded the Distinguished Service Cross. LCT 2337 eventually made a return trip to Normandy with US Navy DUKWs (amphibious trucks capable of carrying 25 men). These were landed successfully on OMAHA beach, but this was at the height of a great gale and after a succession of disabling mishaps in the chaos inside the Mulberry Harbour area, LCT 2337 finally had to be abandoned on 20 June without casualties. For myself this was an end to my involvement in the European war. Many landing craft crews were either transferred to other combined operation units in the Pacific theatre or, like myself, retrained for a return to General Service duties in the Pacific.